The experiences of extended power outages of up to a week due to past ice storms in New England showed that my household systems were fairly resilient. I normally use wood for heat and propane for cooking; so neither requires electricity. The town water system that supplies my household has a backup generator at the treatment plant, and my onsite septic system is gravity-only. Minor loads such as a radio and lights can be powered by rechargeable batteries or a small inverter in my truck. However, the inability to operate my refrigerator/freezer during an extended power loss, while not a matter of survival, was a significant inconvenience. Protecting the year's supply of frozen vegetables and chicken produced from my backyard was desirable, especially during warmer months when food cannot simply be placed outside in the snow. Conventional gas-powered portable generator: low cost, high power capacity; but noisy, high maintenance, and high fuel consumption. Inverter generator (e.g., Honda EU2000i): quiet, economical; but high cost. Solar panel/battery/inverter setup: no fuel needed; but very expensive, limited output, and needs sunlight. Power inverter powered by vehicle: low cost, low maintenance; but requires stationary idling and has limited power capacity. Power inverters use electronics to convert DC power such as the 12 volt DC from a car battery to the 120 volt AC used by household appliances. I choose the power inverter option as a simple way to meet my power needs at a low initial cost and with a low operating cost by using my Prius hybrid vehicle (Figure 1). Inverters can be powered by any vehicle by connecting the power input to the cigarette lighter (small units only, such as for charging cell phones or laptop computers) or directly to the battery terminals (required for higher power inverters). The engine must be left idling if you have any significant load or duration, or else the battery may be drained, and car batteries are not designed for deep cycles. An advantage of hybrid vehicles such as the Prius is that the engine runs only as needed to keep the high voltage (HV) traction battery charged above a certain threshold. Saving fuel may be important during an extended outage when gas supplies may be limited or unavailable. 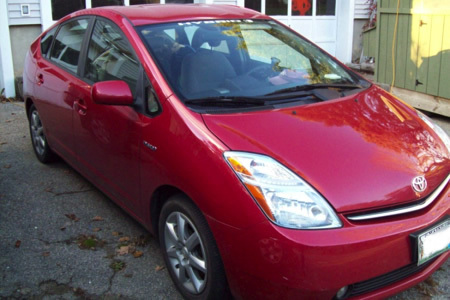 I chose a 1000 watt inverter based on the references at the end of this article which indicated that 1000 watts could be operated safely from my Prius. I also estimated that 1000 watts would be sufficient capacity for my greatest load. My 5 CF chest freezer is rated 5 amps at 115, or about 575 watts, according to the sticker on the unit. I need to buy a power meter to verify the actual power draw, which is highest when the compressor initially starts. The inverter model I purchased was the Xantrex Prowatt SW1000, which is rated for 900 watts continuous power, 2000 watts surge power, and 7.5 amps continuous current. I chose a pure sine wave inverter, rather than a less expensive modified sine wave inverter, in case I need to use this inverter to power sensitive electronics. The place to connect an inverter in a Prius is at the auxiliary 12V battery, located on the right side of the trunk in my 2008 model (Gen II). The auxiliary battery is charged by the vehicle's hybrid system, discussion of which is beyond the scope of this article but more detail is provided in the referenced sources. I put together cables to safely connect the inverter to the auxiliary battery and allow the inverter to be removable. The cables are heavy 2 gauge wire with crimped ring terminals to connect to the battery and inverter. The positive (red) line has an 80 amp ANL type fuse for protection (Figure 2). The fuse holder is not shown in the figure because I was still waiting for the correct unit to be shipped at the time. The yellow Anderson type connectors are rated for 175 amps and allow for quick connection/disconnection. The 12V auxiliary battery can be reached by removing the access panels in the rear of the Prius (Figure 3). Note of caution: Don't do this unless you are absolutely sure you know what you are doing (and I am no expert! ); shorting the battery could cause significant damage to you or your car! The positive terminal on the left is accessed by removing the protective red cover (not shown). To reach the negative terminal, I had to unfasten the battery holder and move the emergency braking power supply pack out of the way. I also temporarily moved a section of ventilation ducting for the HV battery. The inverter power cables have been connected in Figure 4. I routed the cable up through the small opening above used to access the right rear taillights. Completion of the inverter hookup is shown in Figure 5. Next time I'd make the red cable shorter to avoid the unnecessary loop. An extension cord supplies AC power to loads in the house. With the car off, the inverter indicated about 12 volts from the auxiliary battery. 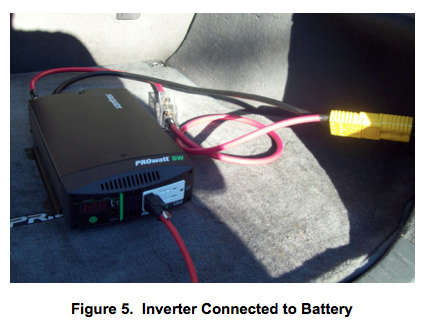 With the car on, the inverter displayed about 14 volts, indicating that the HV battery was charging the auxiliary battery. I tested several cycles of operation of my chest freezer on the inverter with no issues. I also tested a continuous load using a 250 watt heat lamp for several hours. The Prius was left in Park with the hybrid system energized (Ready mode) to keep the HV battery, and in turn the 12V auxiliary battery, charged. 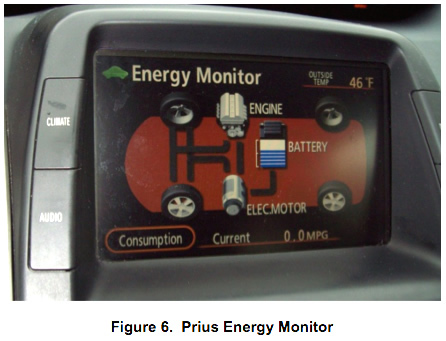 The state of the high voltage (HV) traction battery can be seen in the Energy Monitor screen of the Prius (Figure 6). The Prius hybrid system is designed to maintain the state of charge (SOC) of the HV battery between 40% (1 bar) and 80% (8 bars) for optimum battery life. I observed the battery get down to as low as 2 bars while powering the inverter. Then the internal combustion engine (ICE) would run to charge the HV battery to about 3 bars and stop. The HV battery would gradually drop down again and the cycle would repeat. This is a lower SOC range than I typically see while driving and the engine is running more often, but I don't see any issues. I tried running my refrigerator off the inverter but got an Overload Shutdown fault. My refrigerator is 12 years old, built before the latest energy standards, and I did not expect that it would work with my 1000 watt inverter. A new, more efficient refrigerator may be within the capacity of the inverter as well as cheaper to run on normal utility power. For now, I store extra ice in the chest freezer to use in the refrigerator if necessary. Before purchasing an inverter for your own use, be sure to carefully calculate your peak critical loads. Do not use an inverter in excess of your battery capacity. Install the inverter per manufacturer's instructions. The Xantrex Prowatt SW1000 inverter, 80 amp ANL fuses, and ANL fuse holder came from Amazon.com. I borrowed some ring terminal connectors and a crimping tool from my father, who is currently installing electrical systems in a boat that he is building. These parts can also be obtained at the sources above or from marine and RV suppliers. Thanks, it's always good to learn useful new applications for things. I'd never thought about using a hybrid vehicle but in my younger days when we lived off the power grid, I put a caterpillar battery in the bed of my pickup and connected it into my truck's electrical system. At night I ran jumper cables to the cabin where we had 12V fixtures and another battery. Its not clear to me how your Prius was able to keep the 12V auxiliary battery charged. Mine had the auxiliary battery go dead just from sitting in the showroom. Thanks for this article, very informative. It's always good to know that their is a new application that is useful for everyone. Just like this article, they develop and innovate new things, like energy monitor and upgrade the engine of the car. Thanks for sharing this, I really appreciate it. I'd like to peer more post like this. Be with us here terex colombia for more information. Thanks and Keep posting!